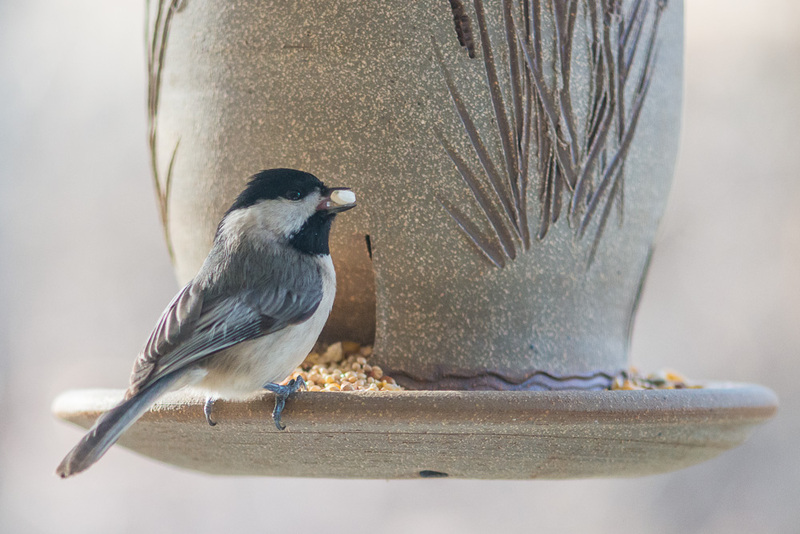 I hung a new bird feeder this week, and it’s been quite a hit, especially with the Black-Capped Chickadees. In an effort to keep it squirrel free, I placed it on the covered front porch, and so far it’s been a safe haven for the small birds. They’ve become so accustomed to my presence this winter that they don’t seem to mind me standing quite close and photographing them as they eat. I’m doing my best to ignore the mess they’re making on the porch deck and railings: power washing it may be a nice money-making chore for Cameron this spring! In the meantime, it’s nice to see them so pleased with their new feeding station, and being just outside my office window, I can even hear their soft chirping while I work at my desk. This image was shot with the Nikon D800E and edited slightly in Lightroom 4 using primarily the Clarity and Vibrance sliders. Oh, I so miss having a bird feeder outside my windows. My apartment complex setup does not lend itself to such a luxury. Thanks for sharing! I have to admit I’m rather addicted to having the birds outside my office window. They are fun to watch and I enjoy their antics. I’m glad you’re enjoying these images; I’m sure I’ll have more!